Kneading is a common behaviour for juvenile and adult cats alike so, chances are, you’ve caught your cat displaying this rather strange looking behaviour. This behaviour actually starts off very early in a kitten’s life. Before they are able to get around and fend for themselves, a nursing kitten will instinctually knead to help stimulate the mother’s milk flow. So why does my cat knead me, I can hear you say?! Well, in your cat’s eyes, you are fulfilling a maternal role, and by allowing him onto your lap and by cuddling him, you are imitating the security that he experienced with his mother as a young suckling kitten. Even though kneading you doesn’t yield milk, your cat will associate the motion with the rewarding comfort of nursing. 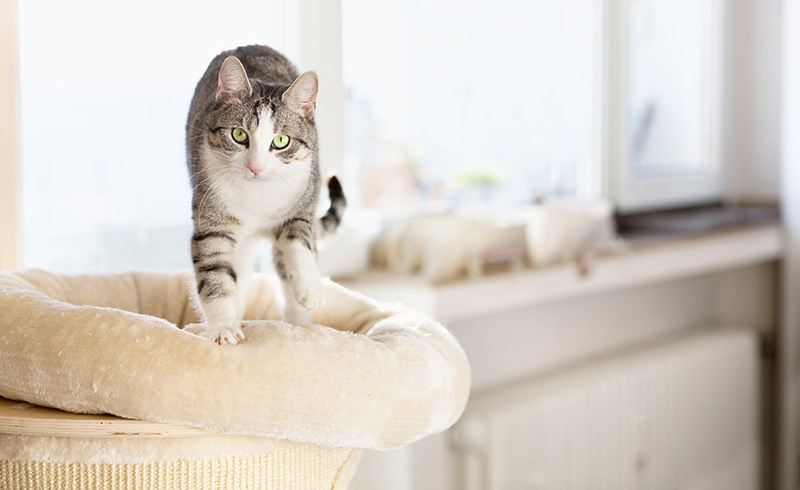 Your cat will still continue to knead, purr, and rub in an affectionate way, and most owners will find this behaviour perfectly acceptable. Unfortunately, this can sometimes be quite painful for the human parent, since the happier your cat is, the harder he will dig in with his sharp claws! In order to make things easier on your legs and for both of you, try placing a thick, soft barrier, such as a fluffy throw, between your cat and your lap. Keeping your cat’s claws short through regularly trimming will ensure comfort for both of you long-term.